Both Ngoni and Luckie performed exceptionally well with the volunteer dog handled by CPT Trainer Patricia King. Luckie completed all the CPT Walking in Pack, Dual Motion, and Single Stationary Drills with flying colors. After understanding the protocols, he was able to walk from 70 feet away to as close as 2-feet away from the volunteer dog without any pulling, barking, or lunging. Moreover, by remaining relaxed, when Luckie and the volunteer dog were proximal each was more comfortable with the other. We then did about half the drills with Ngoni until electing to stop due to a concern about snow and ice accumulating on the roads. We performed the lesson on Wednesday, Feb 25, when Atlanta had significant weather concerns. 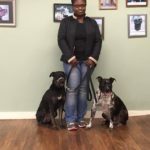 Ngoni also excelled at the drills, which elongate transitions, calm the dogs, and teach them alternative behaviors that replace pulling, barking, and lunging. Leash walking is now far more enjoyable for Remi- and for her dogs. After both Luckie and Ngoni are reliable while walked individually, we will meet again with Remi to teach her and her dogs how to remain calm when walked in tandem.